FOX IV offers a variety of options for Pallet Labeling beginning with the type of printer-applicator best suited to your application. 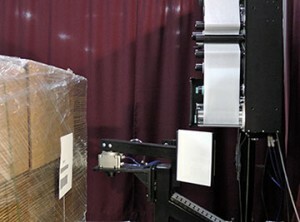 Because most pallet labeling applications have a lower throughput and utilize a label 4″ wide or less, a FOX IV Mini sized label printer applicator is a common choice for pallet labeling. These compact units are available with Datamax-O’neil, Zebra or Intermec print engines. Additional print engines choices and units for wider width labels are available in the Standard and Modular body sizes. These units are great for pallet labeling applications where print engine choice is a must, there are higher throughputs, a label up to 6″ wide is utilized, or a long label is required. For very large pallet labels, labels up to 8.5″ x 17″ can be printed and applied with FOX IV’s 5420 Print and Apply Labeler. 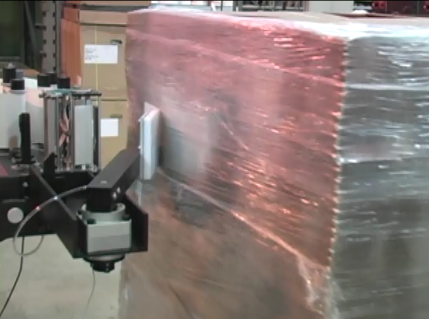 Pallet labelers can print and apply a label to the front, side, adjacent panels or even corner-wrap depending on the application method.